Home • USA California, it's a Nation State • Joshua Tree National Park • Joshua Tree National Park 2008-2010 Click HERE and all the pictures will get big. ...Joshua Tree National Park. We've met here for a day-after-Christmas day at the park. We stayed at Circle C again, as always. It's a great location and much as we like the family and the whole ambiance of the place, the quality of the rooms have been declining steadily, relentlessly. Some, even for not-really-fussy me, were unacceptable. I looked at three rooms before agreeing to the last. ...Pine City, where yes there are pine trees. Pine City is actually a large formation of sandstone weathered into huge shapes with space between the shapes for wandering. What do you see in these formations. .
Any bit of wildlife is so exciting out here. Roger's proof that indeed there must be giants. What goes with any drive to and from Joshua Tree, the Palm Springs windmill farms, shot from the car window. Here we are on opening day of our Joshua Tree National Park outing, Sandy getting on her gloves and Nancy wrapping her headscarf. It Was COLD. And the Wind was Whipping around out there and we were thinking maybe it was just plain too cold to be out in the world. But we soldier on. Our first stop, the Live Oak trail. Look, there was even plenty of snow left from yesterday's storm. But then the wind calmed down and we were simply Cold, the level of cold we could manage. Joshua Tree is such a marvelous place, so full of Marvels! The live oak from the Live Oak trail. Next stop, the Cap Rock nature trail. And then the walk to Barker Dam. Oh goodie, a giant insect stalking the desert floor. This configuration changes colors every hour as the sun passes over the rocks and the clouds pass by the sun. Barker Dam. Do check down this story to my trip with Cynthia in March and you will see an amazing difference. I copied this quote from the internet...here And in the stroy from March. "According to legend, Mormon pioneers considered the limbs of the Joshua trees to resemble the upstretched arms of Joshua leading them to the promised land. Others were not as visionary. Early explorer John Fremont described them as "…the most repulsive tree in the vegetable Kingdom." We had our Christmas Day dinner at Denny's, Denny's being The Only restaurant open within 30 miles as guaranteed by Gavinda, our host at the Circle C.
We had a cutie-pie waiter who was workin' us for a nice tip. He was a pretty bad waiter but plenty entertaining so he won for that 30% tip on a Denny's senior special. BTW - Food! Travel night-dinner at Denny's(!). Today we ate breakfast at the motel 'buffet' which consisted of bagels and peanut butter, lunch at the Crossroads Cafe that was surprisingly delicious, and dinner at the Twentynine Palms Inn which was also delicious but that was what we were expecting. Then we drove back into the park for some stargazing, and then enjoyed the jacuzzi and had hot cocoa and biscotti back at the room. What a great day! Good morning! We're off for our ambling drive home. In 1994 the town of Twentynine Palms sponsored a Mural Project, now called 'The Oasis of Murals', in hopes of reviving the community. There are a few more than 20 of them now. Many of these huge projects have a military theme because Twentynine Palms hosts a major military installation (Marine Corps Air Ground Combat Center (MCAGCC)) and the town is full of service people and those who service them. It's worth a drive out here just for a look at the murals, but of course don't miss the park! Today's first stop, White Tank campground and hike to Arch Rock. We all agreed the campground is utterly amazing and the walks are perfect. The camp sites are each nestled into protected areas of parking, tent pitching, picnic table, campfire ring, and cooking grill. There are only 25 sites, no water, and a few chemical toilets, but so cozy we all want to stay here. Sandy made a painting! What she said: "Here's a drawing based on a photo from our trip. It's the shaggy palm ghost chasing the cactus." Then we drove on through the park, through the two deserts, stopping for a stroll through the Cholla Cactus Garden. Hi ladies! Notice how it is still cold, but we are no longer entirely bundled-up, swaddled head to toe. Cottonwoods and palm trees soaking up the available spring water. And then what's a road trip without at least a little car trouble? A side trip to Sears in Palm Desert, and 500 bucks later...we back on the road, and home snug in our beds before 10pm, happy in the marvels of Joshua Tree National Park, and brakes that work. We're off this morning to enjoy the dramatic sights of Joshua Tree National Park. But first we goofed around, ate breakfast, stopped off at some stores, drove, drove, ate lunch, drove, drove, and then checked in, and stopped off at the Visitor's Center for maps. We ate dinner at a Mexican place down by the Marine base where 'Marine Haircut' joints dominate the strip malls. I grabbed just a few shots towards evening for something to do tonight. It's blooming season in the desert! Sunset out the back door of our motel. Most unfortunately, there were no Joshua Trees in view. Fortunately there were palm trees...and photoshop...and 'color burn'. "Viewed from the road, this desert park only hints at its vitality. Closer examination reveals a fascinating variety of plants and animals that make their home in this land shaped by strong winds, unpredictable torrents of rain, and climatic extremes. "Dark night skies, a rich cultural history, and surreal geologic features add to the attraction of this place. Come see for yourself!" Everybody was clicking away like crazy clickers click click click. Me too. And Cynthia too. Clicking away. Joshua Tree is a renowned destination for rock climbers and you'll see more of them coming up. This climber is in the middle in the upper third of the photo. Don't miss the woman's backpack. Awww. That snow capped peak is either San Gregorio or San Jacinto - I think. All the Joshua trees were blooming. It really is dramatic. A National Park self guided walk. The National Park Service - my favorite bureaucracy. Here's an Internet comment speaking of the different eco-systems in Joshua Tree: "The higher, slightly cooler, and wetter Mojave Desert is the special habitat of the undisciplined Joshua tree, extensive stands of which occur throughout the western half of the park. "According to legend, Mormon pioneers considered the limbs of the Joshua trees to resemble the upstretched arms of Joshua leading them to the promised land. Others were not as visionary. Early explorer John Fremont described them as "…the most repulsive tree in the vegetable Kingdom."" At this level in the desert the wild flowers are soo small and nestle themselves against some protection. The Rangers told us to take the long drive down to Cottonwood Springs to see more, and we'll be doing that tomorrow. That's Cynthia enjoying a quiet time on the rock in the center of this photo. All the campsites in the park were totally full and all the motel and hotel signs said 'no vacancy', and it's the weekend with perfect weather for daytripping, and yet except for having to wait to park, we didn't feel crowded at all, and it was Quiet. If you want to climb these rocks all you have to do is show up with your ropes and you're on. I really was surprised that they don't take reservations and you don't need any kind of qualification. These guys will help you. I'll watch. From the Black Rock Visitor's Center, here was one long steep walk! You can't even see the car it's such a speck down there by the road. We think we must have taken a wrong turn! We went back into the park at night. Yikes. That's the moon there behind that Joshua Tree. And those are Stars! Cynthia framed this one and it turned out just like she hoped it would. Here's the courtyard of our motel, The Circle C, with its lovely pool we never used and its lovely jacuzzi we never used and at the far end is the breakfast room we used every morning. The rooms are gigantic with super high ceilings, plenty of windows, a big couch, two big puffy chairs, a kitchen and kitchen table and chairs, so despite that all these items were a bit ramshackle, we were entirely comfortable. We're headed down now on the winding 30 mile drive to Cottonwood Springs. 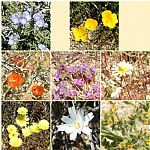 Here's a great pull-out to enjoy the Cholla Cactus Garden. You can see some people on the far right edge to get an idea of how big these babies are. I wonder if those nubs will be/have been flowers?! "Two deserts, two large ecosystems primarily determined by elevation, come together in the park. Few areas more vividly illustrate the contrast between “high” and “low” desert. Below 3000 feet (910 m), the Colorado Desert, occupying the eastern half of the park, is dominated by the abundant creosote bush. 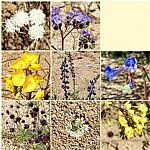 Adding interest to this arid land are small stands of spidery ocotillo and cholla cactus." Continuing on down the road come the fields of flowers and photographers lugging their tons of gear across the desert floor. "Standing like islands in a desolate sea, oases, a third ecosystem, provide dramatic contrast to their arid surroundings. Six fan palm oases dot the park, indicating those few areas where water occurs naturally at or near the surface..."
...All THIS. This picture and the next are all shots from just that one block stretch. More! Sooo many kinds and they are all sooo little. And then,we're heading home. Happy Birthday Cynthia! I love you! !